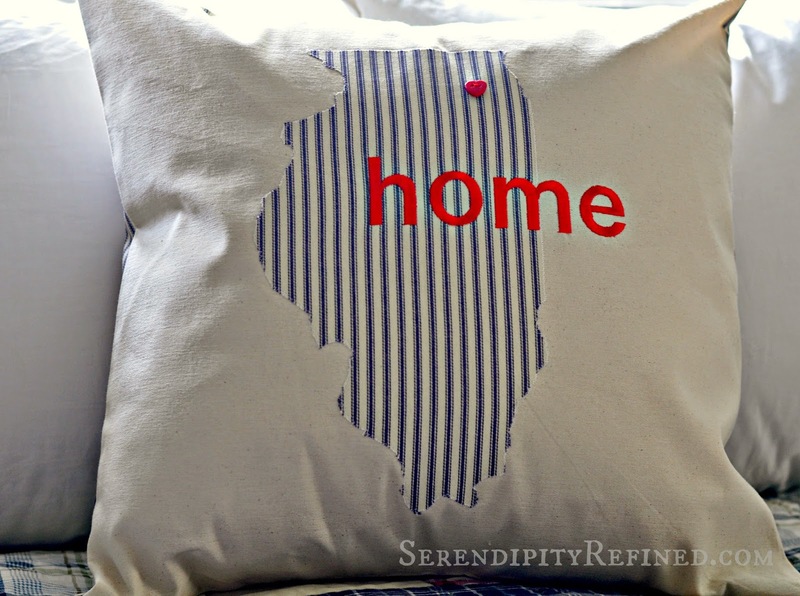 In my mind, it started out as a pillow with a city name and a star button on it but once something rolls around in my head for awhile, it usually changes. The city name idea was abandoned in favor of something more important. The star became a heart...because after all, home IS where the heart is, right? This week I was contacted by a couple of shops in the area who are interested in carrying my hand made items so I decided to finally make one of these as a sample. I'm also working on some Christmas themed items that I'll show you next week. I'm really pleased with the results. 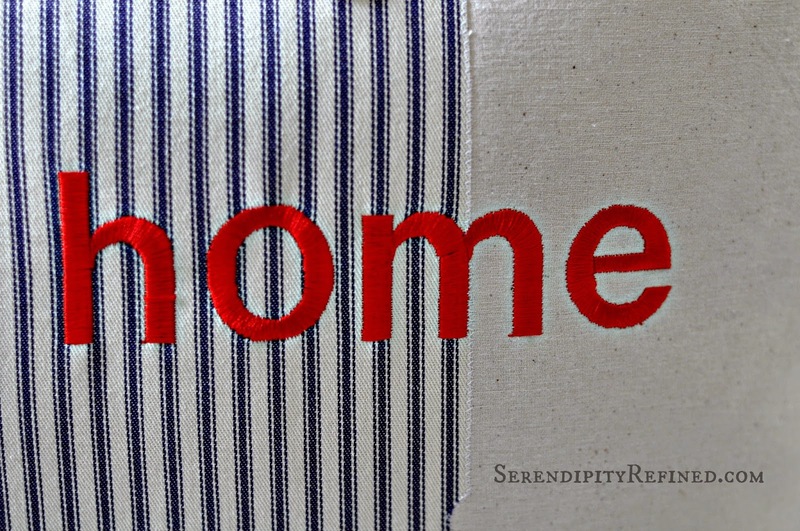 I love the combination of the ticking stripe with the canvas and the pop of red against the navy and ivory. 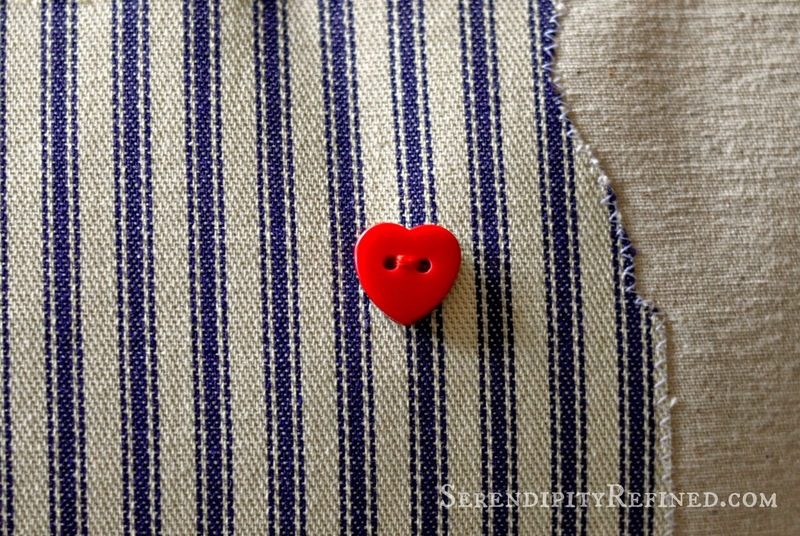 I've sewn a heart shaped button in the spot on the map where the farmhouse is located. For now, this is where my heart resides. At the top of a hill in a suburb outside of Chicago there's a red brick ranch with no landscaping and bad windows. It's the place where I gather with family and friends to share stories and dreams and the stuff of everyday life. It's full of laughter and dog hair and piles of furniture that needs to be painted and projects that need to be finished. It's in this almost farmhouse in Illinois that I'm making memories amid the stacks of floor plans and baking cookies among the boxes that will be a part of our daily existence for the next year or so because life won't wait for construction to be complete and because no matter what it may look like, it's the people who fill it that make this our home. As a girl from Kansas wearing glittery ruby red slippers once said, "There's no place like home." and this girl from Illinois wearing cowboy boots that usually have glitter on them (from October through March) wholeheartedly agrees! 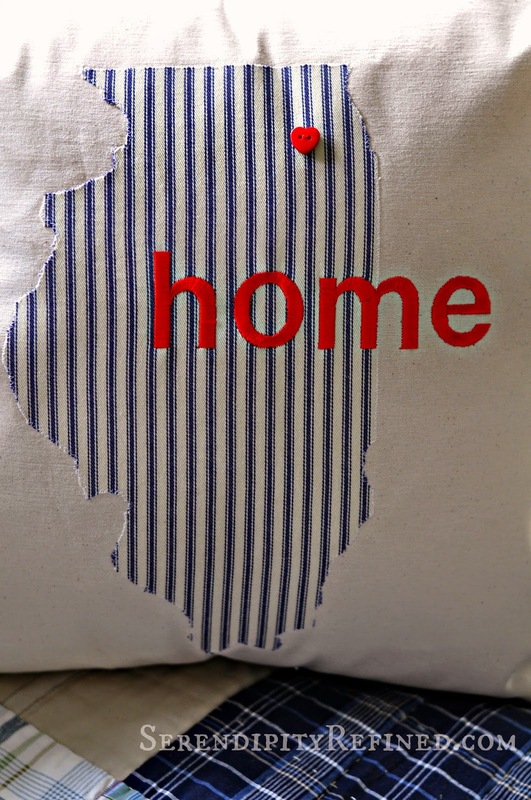 If you'd like to make your own State silhouette "home" pillow, I found the Illinois state silhouette online and printed it out. 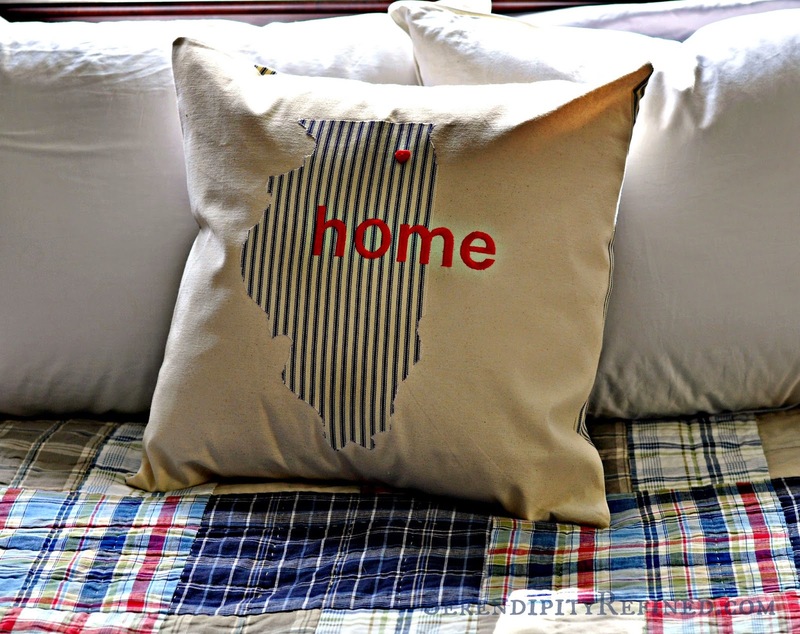 I cut it out and made an applique using cotton pillow ticking fabric and fusible interfacing which was first ironed on to the ticking fabric and then sewn into place on a 20x20 inch piece of cotton canvas drop cloth fabric. 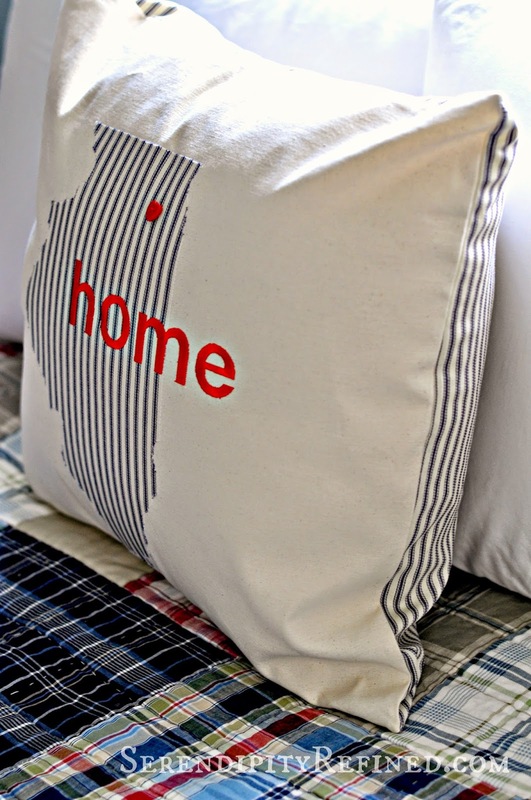 The back of the pillow is ticking stripe with a simple envelope closure. These pillows are not currently for retail sale. I am taking custom orders via email at SerendipityRefined@gmail.com. Watch the Serendipity Refined Facebook page for updates about new retail locations.